Proudly serving the residents of Genesee County for 20 years. You've got questions? I've got answers! Please read my Frequently Asked Questions page. If you need your scanner programmed, contact Ron Sujkowski. For all of your scanner needs, I highly recommend Scanner Master, the Internet's largest selection of scanners, antennas, accessories, programming software, and a whole lot more for the lowest prices anywhere. Please click below to begin shopping. January 28, 2019: Added more school frequencies (Clio, Davison, Flushing, Lake Fenton, Pieree-Sarvis). February 13, 2019: Added even more school frequencies (Academy of Flint, Genesee Area Skill Center and Grand Blanc). March 4, 2019: Added PL tone for MSE Branded Foods (operator of two restaurants at Bishop International Airport) and moved it to the airports section. March 25, 2019: The Flint City Firegrounds (talkgroups 12919-12923) are now known as Firegrounds 11-15 to avoid confusion with Countywide Firegrounds 2-10. March 29, 2019: Added the second Genesee County Sheriff's Department - Corrections Division talkgroup (22825) to the sheriff's department section. April 3, 2019: Added Terry Matlock Schools of Performing Arts frequency to the local businesses section. All data on this page is for informational purposes only. I am pro-police / pro-law and anti-crime / anti-criminal. I do not condone illegal and / or immoral and / or detrimental use of radio scanners in any way or any other illegal and / or immoral and / or detrimental activity of any kind. Also, I advise all scanner users to stay safe while listening: NEVER enter an active crime scene, fire incident or emergency medical situation, or interfere with first responders' actions, or impede their vehicles and equipment. PLEASE READ THIS SECTION BEFORE EMAILING ME WITH QUESTIONS: All Genesee County police, fire, EMS, and county government services, as well as state government agencies, use the Michigan Public Safety Communications System (MPSCS) a Project 25 Phase I, APCO-25 Common Air Interface Exclusive digital trunked system. Genesee County has a set of eight towers (in Northern Flint, Southern Flint, Goodrich, Davison, Flushing, Swartz Creek, Montrose, and Rogersville), with its own set of frequencies, and all communications on it are simulcast countywide. For a list of compatible scanners, see my Frequently Asked Questions page. Read these informational articles for further details about the trunking system used in Genesee County. 853.8125 (primary control channel), 853.7875 and 853.7625 (alternate control channels): Lapeer County Simulcast System (towers are in Lapeer, Imlay City, Columbiaville, Brown City, Almont, and Metamora). 853.9875 (primary control channel), 853.8625 (alternate control channel): Saginaw County Simulcast System (towers are in Saginaw, Hemlock, Bridgeport, and St. Charles). The four/five digit numbers listed below are not frequencies, they are called talkgroups. Read the trunking basics explanation article linked above for further details. 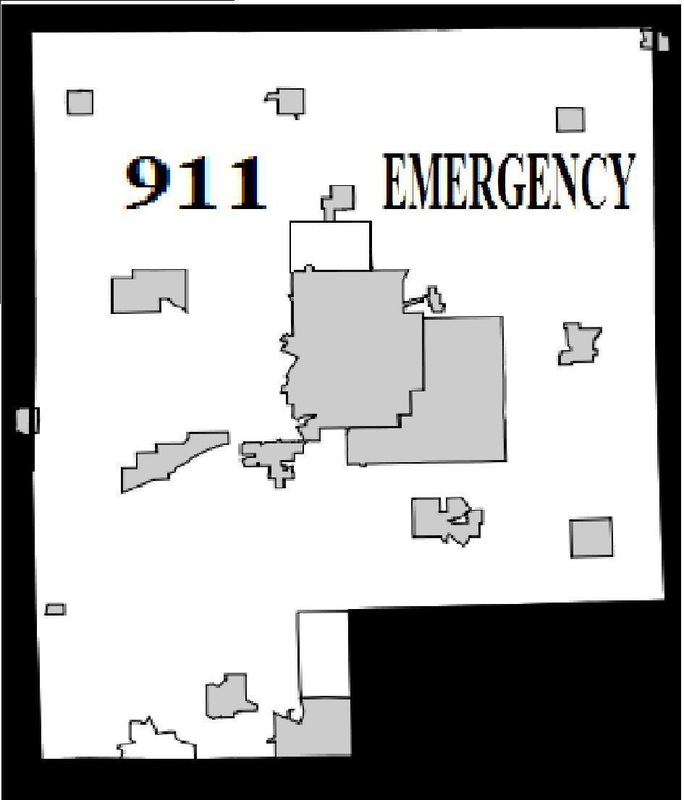 Genesee County 911 dispatches every police department in Genesee County except Fenton City. Flint City is dispatched on separate talkgroups than those below. The following talkgroups are used for inner-department communications (usually car-to-base and car-to-car). They are usually referred to as "local", "private", or "channel 3". 2521 Metro Police Authority of Genesee County - private talkgroup (Serves Mundy Township, Swartz Creek City, and Gaines Township). Genesee County 911 dispatches every fire agency in Genesee County except Fenton City. Firegrounds are assigned by Genesee County 911 immediately after incidents are dispatched. Some agencies may elect to use their private talkgroup instead, and Flint City uses their own firegrounds. See the next section for further details. Agencies may elect to use their private talkgroup instead of a countywide fireground for minor incidents which don't require mutual aid from other agencies. Additionally, they are used during training sessions and radio testing. They are usually referred to as "proprietary". 2472 Flint Township Fire Department - private talkgroup (a.k.a. F27). Note: 151.01, PL tone 127.3 ("Tac 6") is used as a non-emergency backup. For major incidents when several agencies are called in for mutual aid, the following talkgroups are used in addition to countywide firegrounds to coordinate actions of the different agencies outside of the incident. 12925 Flint City Police Department - proprietary (unconfirmed). Flint City Citizens Radio Patrol is a neighborhood watch group sponsored by the Flint City Police Department who uses the department's old VHF radios and frequencies to provide extra security during special events. Further details: here. Fenton City has their own 911 system and dispatches their police and fire departments independently of the rest of Genesee County. Additionally, they dispatch Stat EMS units inside their city. Surrounding agencies and Genesee County 911 also have access to their talkgroups. 1611 Mobile Medical Response (MMR) - South District Dispatch - Genesee and Shiawassee counties. (Based in Saginaw County). 1622 Twin Township Ambulance - private talkgroup (based in Shiawassee County). Used by ambulances from outside of Genesee County. Please note ambulances use different PL tones than hospitals. Used for coordination between medical helicopters and Fire/Rescue/EMS ground units. These are MPSCS. 162.475 Weather reports via the National Oceanic and Atmospheric Administration (NOAA) - Flint area / Mid Michigan (broadcast from White Lake with the transmitter near Clio. This is a recorded loop, sounds like computer, updated several times daily). Bishop International Airport's air traffic control tower is open 365 days a year from 5:45 AM ET to 11:30 PM ET. Cleveland Air Route Traffic Control Center ("Cleveland Center") controls its airspace and the airport after hours via the Flint Remote Communications Air-to-Ground (RCAG) repeater at Bishop International Airport. Sectors 12 and 16 are linked 24 hours, sectors 18 and 19 are linked 24 hours, and all four sectors are linked overnight. 133.15 Bishop International Airport Automatic Terminal Information Service (ATIS) / Automated Sky Observing Station (ASOS) - after hours. Recorded loop of airport information and local weather conditions, updated hourly. 451.6875, 451.7625, 452.0875 Unknown use. Possibly MOTOTRBO DMR (unconfirmed). BIAA Public Safety is on the MPSCS. Police units call their talkgroup 257, but Crash, Fire & Rescue units call it F42. 154.995 Maintenance Department - Channel 1. PL tone 179.9. Also used as a backup for public safety. 154.695 Maintenance Department - Channel 2. PL tone 179.9. Also used as a backup for public safety. This frequency has possibly switched to MOTOTRBO DMR (unconfirmed). BIAA ground crews can also talk to the control tower on the Ground Control and Tower frequencies. 460.75 Delta Air Lines/Delta Connection - Ground crews. DPL tone 315. This frequency has possibly switched to MOTOTRBO DMR (unconfirmed). MSE Branded Foods operates the Rochester Mills Brewing Company and Gateway Grille and the Samuel Adams Flint Brewhouse inside Bishop International Airport's terminal. For the General Motors factories' systems, see here. For Electro-Pro's business systems, see here. 461.15 Genesee Valley Center - Security Channel 1 (Color Code 1, Talkgroup 101, Slot 1). MOTOTRBO DMR (unconfirmed). 461.15 Genesee Valley Center - Security Channel 2 (Color Code 1, Talkgroup 210, Slot 1). MOTOTRBO DMR (unconfirmed). 453 Vogt's Flowers (Color Code 1, Talkgroup 901, Slot 2). MOTOTRBO DMR (unconfirmed). This is an EDACS Networked Standard analog trunked system. The frequencies must be programmed in the correct order to trunk track it properly. For further details see this Logical Channel Number informational article. 463.425 Security (Color Code 1, Talkgroup 1, Slot 1). MOTOTRBO DMR (unconfirmed). 452.4 Unknown use, possibly MOTOTRBO DMR (unconfirmed). Flint MTA is now using the MPSCS. Email me if you know what channels 14-17, 19, and 21 are used for. 12798 Channel 12: Your Ride Dispatch - Senior Care. Affiliated with Genesys Health System's Program for All-inclusive Care for the Elderly (PACE). All Class I Railroad Police Departments in Michigan use the MPSCS. Note: Amtrak's Blue Water trains use CN Channels 1 and 2B on the CN Flint Subdivision. LSRC uses CSX's frequencies while in Flint McGrew Yard. MCC Public Safety uses the MPSCS, in addition to their old UHF frequency. U of M Flint Campus Police is now on the MPSCS in addition to their old UHF frequencies. 2674 Campus Police - Dispatch (simulcast on 462.05, and can be linked to all other frequencies below). Baker College of Flint Campus Safety is on now the MPSCS. 452.175 Flint Community Schools - Channel 1 - unknown use (Color Code 1, Talkgroup 600, Slot 1). MOTOTRBO DMR (unconfirmed). 452.175 Flint Community Schools - Channel 2 - unknown use (Color Code 1, Talkgroup 600, Slot 2). MOTOTRBO DMR (unconfirmed). 462.525, 464.375 Grand Blanc - repeater. DPL tone 054. Possibly switched to MotoTrbo DMR (unconfirmed). 152.3 (PL tone 218.1) and 157.665 (PL tone 179.9) Flint Auto Auction, Inc.
Services provided include severe weather reporting and disaster relief. Part of the Michigan Amateur Radio Emergency Team and Michigan Specialized Communications Group. All repeaters are in Flint. Traffic and Training Nets are every Wednesday at 8:00 PM ET. Social Nets are every Monday at 8:00 PM ET. Both repeaters are in Flint. Traffic and Training Nets are every Thursday at 7:00 PM ET. Part of the Central Michigan Emergency Network (W8CMN).